Yes, I know. 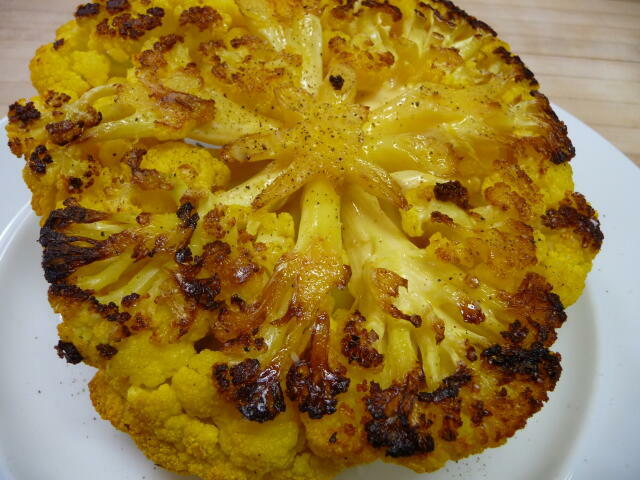 Cauliflower is not high on the list of favorite veggies but honestly, you need to try roasting it. The flavor is sweet and the texture tender. I played around with white, purple and this golden yellow variety that I think is gorgeous to look at. Are you game to try it? Cut a slice from the top of a whole cauliflower to help it lie flat. Brush the head with olive oil and season with salt and pepper. Place cut side down on a lightly oiled baking sheet and roast at 350F for 35-40 minutes. The piece you cut from the top can be cooked along side; it will cook faster than the head, so remove when done. To serve, slice or cut into small pieces. Love reading blog on website. Tried to sign up for posta and something is wrong with the link to do so.